I recieved this for review. As always, my reviews are fair and unbias! On the night before they leave for college, Clare and Aidan have only one thing left to do: figure out whether they should stay together or break up. Over the course of twelve hours, they retrace the steps of their relationship, trying to find something in their past that might help them decide what their future should be. The night leads them to family and friends, familiar landmarks and unexpected places, hard truths and surprising revelations. But as the clock winds down and morning approaches, so does their inevitable goodbye. The question is, will it be goodbye for now or goodbye forever? I've always been a huge fan of Jennifer's "one night" novels. As soon as I read the synopsis for Hello, Goodbye and Everything Inbetween, it sounded like another hit and I couldn't wait to delve in. This night is particularly important for Clare and Aidan. It's the night before they go away to College, and on their check-lists of final things and decisions to be made, there's only one thing left: break up or stay together. They love each other and there's no doubt about that, but the question still hangs in the air. Over the pan of twelve hours, Clare and Aidan take a trip down memory lane to the best moments of their relationship, trying to find some kind of sign to point them in the right direction - the direction that they should follow for their future. This fast-paced, wonderment of a night leads them to their closest friends and family, places around town and most of all, an epiphany of sorts. All that was left to do was choose goodbye forever, or just for now. Full of friendship, emotion and sentiment, Clare and Aidan's relationship is a flame that is on the verge of being blown out, but their affection for each other leads to a brighter fires despite the risk of being expelled. Overall, Jennifer's newest novel was brilliant, bursting with wisdom and enchantment and even though it's not my favourite that she's written (This Is What Happy Looks Like shoutout! My favourite), it was still a great read that kept me wrapped around it's finger for a whole day of reading, that I would recommend to fans of Sarah Dessen and Jenny Han! YA fans of Contemporary Romance! 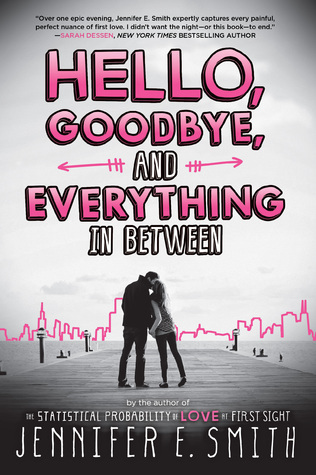 Have you read Hello, Goodbye and Everything Inbetween? Let me know in the comments or on twitter @LittleMemoirs!